Patriots News · Nov 12 STATE CHAMPIONS! 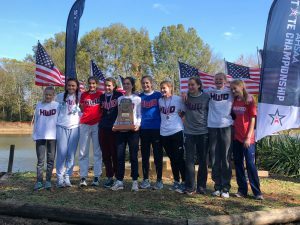 It was a historic day for Homewood Cross Country on Saturday at the AHSAA State Championships as both the girls and the boys earned the 6A team titles. This was the 7th year in a row for the boys, and the second title for the girls, who have won two of the last three. The Cross Country and Track and Field program now has a total of 23 state championships. The girls came in as slight underdogs to defending champions Fort Payne, but Homewood had their best race of the season and won by an impressive 38 points. Homewood scored 34 points to win, Ft. Payne was 2nd with 72, and St. Paul’s was 3rd with 105. Four girls earned All-State honors by placing in the top 15, and Lainey Phelps won the individual title for the second time in her career. The boys also dominated the competition to win their 7th championship in a row by scoring 38 points. Cullman was 2nd with 94 points, and Hartselle was 3rd with 163 points. 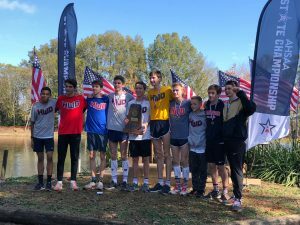 The boys had six athletes earn All-State honors by placing in the top 15, and Will Stone won the individual title for the third year in a row. He is only the third athlete in AHSAA history to win three titles, and he is the first to do so since Steve Allen in 1985. Here is a full listing of the individual performances by Homewood athletes.